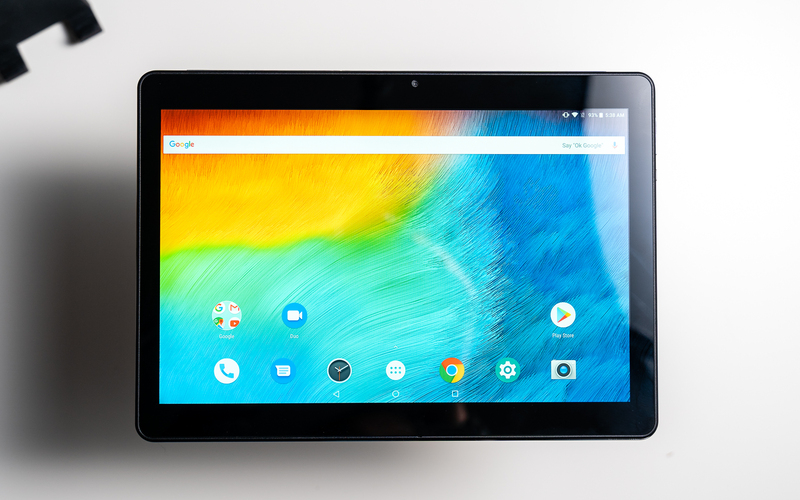 The Teclast M20 is a 10.1-inch Android tablet from China that, even though it is quite inexpensive, offers interesting hardware. In fact, it has LTE built-in, an Helio X23 deca-core processor and a high-resolution screen. It is running Android 8.0 Oreo out of the box. Here is everything you should know about the Teclast M20. The Teclast M20 has a 10.1-inch display with a very high resolution of 2560 x 1600 pixels. Yes, it has a higher resolution screen than most tablets in this price range. While it is an IPS panel, it is not laminated and does not support an active pen. Inside the tablet runs a MediaTek Helio X23 deca-core processor with ten cores clocked at up to 2.3GHz. Other specs include 4GB of RAM and a 64GB internal storage. It features WiFi, Bluetooth, LTE 4G, and GPS. However, it does not support the LTE band 20 which might be necessary for a couple of European countries. Even though it is so inexpensive, the Teclast M20 has an almost full metal body. However, there is a little plastic lid at the top. Behind this, you can find two SIM card slots and a micro SD card slot. Additionally, we get two cameras with a resolution of 2 and 5 megapixels, as well as a micro USB port and a headphone jack. The M20 is running almost vanilla Android 8.0 Oreo out of the box. It probably will not get any updates. You can get the Teclast M20 starting at 149,99 US Dollars if you can get it as a deal. Otherwise, you have to pay a bit more. The tablet was released in late summer of 2018 and is mainly available in China through import shops. These ship almost worldwide. Obviously, every tablet has possible alternatives and the Teclast M20 is no different. The most interesting one is its bigger brother which is called Teclast T20. While it is running Android 7, it offers a better performance, a nicer screen, a more premium-feeling build quality, and a fingerprint scanner. Other competitors are the Teclast P10 and Amazon Fire HD 10. The Teclast M20 is a 10.1-inch Android tablet from China that usually is very inexpensive. Even though it is cheap, it offers a full metal body, integrated LTE, and a high-resolution screen. Other specs include a deca-core processor, dual SIM slots, and Android 8.0 Oreo.